If you’re suffering from the problem where after you resume your PC from power saving mode (usually monitors in standby and screen locked), and windows get re-sized and re-positioned in the top left corner (or just where you didn’t put them), you may have found yourself reading Dell’s article http://www.dell.com/support/article/uk/en/ukbsdt1/sln295708/display-windows-move-resize-after-resuming-from-sleep-state?lang=en and wondering how resolution has anything to do with the problem. Worry no more. It’s a 3-step process to fix it. 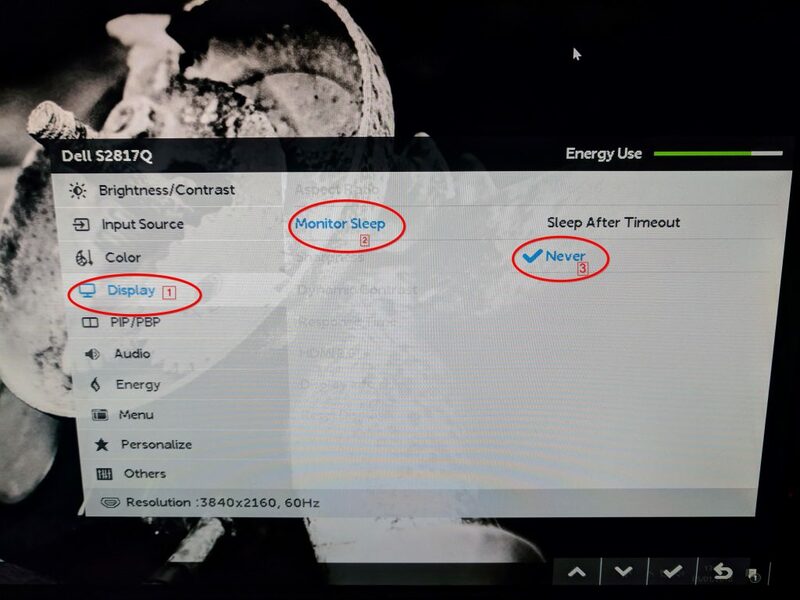 You just need to do it from the monitor’s external/physical power management settings. Witness the photo below. Since the power management appears to be at fault, I have to assume that the monitor actually powers itself off, causing the OS to think it’s disconnected, which results in windows being rearranged. Flipping this setting to “Never” fixes the issue for me. The display continues to go into power-saving mode controlled by the OS. Was this post helpful in solving your problem? Please leave a comment! You’re curious what this Android TV thing is and what’s in store for you if you wind up with an Android TV; Read on. Not exactly. As far as apps go, Android TV is not much better than any other TV OS out there. As you can’t simply execute any mobile phone app on the TV (which is sensible considering the different input sources available on phone vs TV), the app selection is limited to apps that have been designed for TV. For TV-related needs such as watching videos, playing music and playing video games, there isn’t much to complain about. I will spare you the typical talk about beauty (it is beautiful to me), organised (I think that at least Google put some thought into menu layout) and Sony generally in keeping to tradition makes a well-laid out remote control. it prevents you from accidentally operating the remote control when you’re otherwise simply moving it away from the spot on your sofa that your feet have just now decreed that they wish to rest. It must therefore, make it’s mark — or miss it in how well it serves you as a TV. In this regard, for someone who upgraded from a previously dumb Panasonic TV from 2013 to a Sony XE-85 series Android TV, there is a mixed bucket of hot and cold, resulting in an overall neutral if not slightly negative result. Here go the key things I’ve noticed shifting my habits to work within Sony’s implementation of Android TV. Out of the box, the TV was a laggy and relatively frustrating experience. This is pretty much fixed in the latest firmware (PKG6.2671.0070EUA at the time of Writing this — 31-Dec-2017). Remote control input is generally relayed fast enough to match expectations. It makes me wonder if it’s a lack of computing power, or just insufficient software optimization, but one of the still-noticeable deficiencies is with voice input: it takes a few seconds after clicking the voice input button before the system is actually listening to you… Why? Sony’s Android TV will “helpfully” start showing you movie Trailers from Google’s Play Store when it thinks there is no active input source currently available, and there is no way to turn this off. This happens frequently for example, after a gaming session on a playstation 4. When the console goes into standby, the TV will automatically start playing movie trailers at a volume (anecdotally) 50% higher than what you were previously listening to, startling everyone in the room in the process. This is even more frustrating because the “Prog +/-” buttons which are unneeded if you don’t watch Terrestrial/Youview TV will automatically launch these high-decibel trailers if you accidentally press them, since the spam is launched whenever you try to switch inputs and there is none available. Google’s voice recognition is generally accurate enough to be acceptable. The trouble with the implementation in Android TV is the fact that the voice input button is not unversally supported, and they haven’t done a thorough job of classifying what voice commands are global, and which are app-specific. You would think that if you said “open Netflix”, that would be a global command that would do exactly what you ask wherever in the TV you happen to be, but in practice, what it does depends on the app you’re using. In youtube, voice input “open Netflix” will do a Youtube search for “open netflix” and show you a bunch of videos you do not want. In the Netflix app, the voice command does nothing… Heh. Being familiar with Computing, I can understand how difficult it is to build software systems, and you could perhaps expect future updates to improve this. The only catch is, at approximately one firmware update per Year or more, this may never reach it’s full potential in it’s lifetime. Perhaps Netflix may update their app sooner and improve this? It’s well-known that Amazon is the sworn enemy of Google and Android (to Amazon’s detriment, in my view), but Sony somehow got Amazon to make the Amazon Video app for it’s Televisions. As a Prime Member who periodically wants to watch The Grand Tour, the app is a helpful addition (which spares me from using a video game console, as Amazon flatly refuses to implement Chromecast support). As someone who likes watching high quality video, Amazon just can’t help but keep treating it’s customers with disdain. 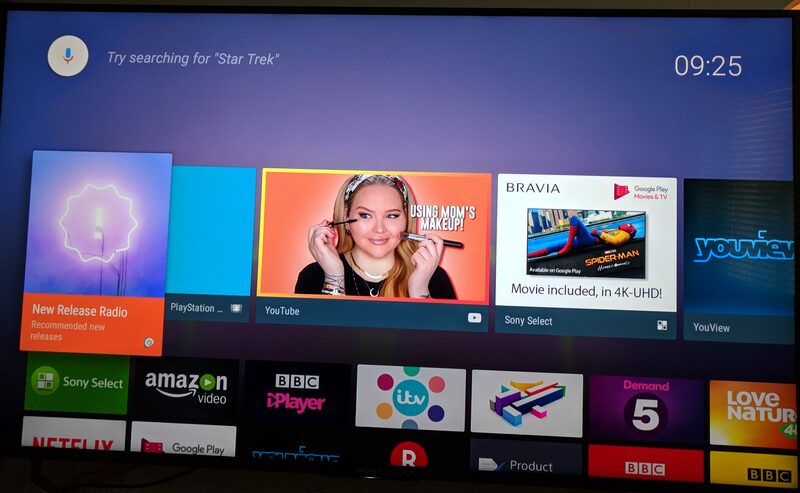 Note, all my vitriol is directed at amazon in this section, but as this contributes to the overall experience of using Android TV, it’s a slight dent on the platform as well. the app quits when it’s backgrounded. So you can’t easily go do something else briefly and then come back to the home screen and hit resume on your video. What Amazon fails to understand is that they’re not somehow making me seek out Amazon hardware by making it difficult to get their stuff on Android. They just make me use Netflix more, except of course for the one Amazon Exclusive show that I care to watch (Grand Tour). Dear Amazon, you should make your content easier to access by your customers no matter what platform they are on, like Netflix does. The Chromecast is a useful device. An essential device for anyone who occasionally has people over and they need youtube music to keep the guests entertained. Youtube has a nice feature where a group of people connected to a Chromecast can queue up music to play centrally. This is how parties rock in the future where building codes pay no heed to sound isolation and you still need something to link people together and get them grooving. I have found nothing yet that works quite as well as letting everyone take turns playing their favourite songs. Even at low volumes, it generates a lot of discussion and debate, which is a key ingredient of a low-key house party. Having the cast protocol built in means that you can for the first time use the Play/Pause, Skip buttons on the remote control to control cast playback, something that the standalone Chromecast quite oddly does not support. Again, Sony reminds of their class. The HDMI-CEC implementation is seamless. It makes sense why the Playstation 4 does not have a Sony media playback remote control. With the exception of Startup where you need a PS4 controller to sign in to your profile (since the HDMI CEC way of “pressing the Home button” is a bit convoluted), you can control the entire media playback experience using just the TV remote. Disc Menus, subtitles, audio, pretty much everything I use when watching blu-ray discs. Routing audio via ARC to the AVR is seamless, and the volume controls are routed sensibly. Well implemented stuff (Microsoft, get your act together). The home screen has a row of recommendations. I don’t recall ever seeing BBC iPlayer or Netflix or Amazon content there… perhaps the developers of those apps have not bothered to implement this feature. Can’t blame Android TV or Google for that. Notice the Recommendation about Make-up? LOL. If that were based on my viewing habits, it should be suggesting yet another review of the Mercedes S63 AMG. It’s worth pointing out some things that I have not yet discovered, that I wish were present. I often lose sight of the remote control, and this being a bluetooth device, you’d expect that there’s a beeper built-in so that if you pushed the “beep” button on the TV, the remote would start making noises, making it easier to detect which section of the sofa it’s crept into. You’re out of luck on this one. HDMI 2 (Audio Return Channel) and HDMI 3 are the only inputs that will accept a 10-bit input signal. This is a shame, because if you read the product specifications, it says “all input support 4K connected inputs/devices”. What isn’t very clear is that 4K does not automatically mean HDR… so… if I ever want to connect more than 2 HDR devices to this TV, I’d have to get an AV-Receiver which supports HDR inputs. Android TV is a usable implementation of smart TV functionality. Sony’s design is well-thought out and the built-in Chromecast is nice, and provides a nice screensaver when it’s not otherwise hijacked by the user-hostile Google Play movies trailers. Personally, I find the inability to disable the movie trailers frustrating enough that I will not consider an Android TV next time I’m in the market for a TV (which isn’t too far off, considering a growing household). When I went to the shop to buy this TV, OLED (LG) was out of my budget, and as I generally like Sony’s design choices, it was easier to choose Sony over Panasonic. LG’s WebOS TVs were considered too, but lacking any prior experience with LG devices, I opted to stay closer to home. Next time, WebOS looks like it deserves a look. If doesn’t have any owner-hostile features like the movie trailers, it just may be the better smart TV platform.